The Captain woke us up at 7am. His Italian accent came in loud and clear of the P.A. system, and from his heavy tone, we instantly knew he was not the bearer of good news. For the second time on this cruise, we would be unable to weigh anchor and take tenders, or shuttle boats, ashore because of dangerously strong winds and choppy waters. A visit to St. Barts would not be in the cards, but like any good captain (and employee of a good cruise line), he had a plan B. We headed to St. Kitts instead. 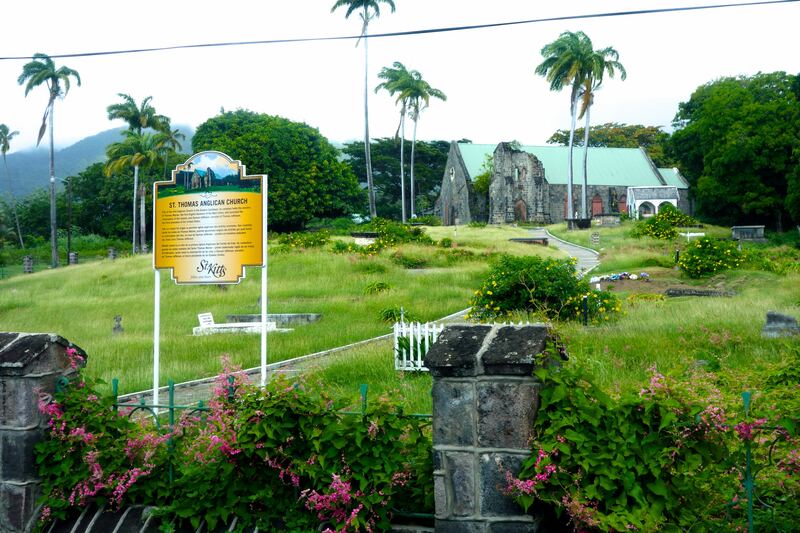 Driving through the countryside of St. Kitts, we encounter an old Anglican church, a reminder of British Colonial influence on the island. With the Caribbean on one side and the Atlantic on the other, this seemed the perfect spot to get tropical and savor coconut juice and sugar cane. Once on land, we boarded a mini-bus for a three-hour tour of the island. Driving from the port to the outskirts, we passed through the high-roller neighborhoods, as well as humble (and sometimes ramshackle) villages. We got out for some hilltop views gave us a better understanding of the lay of the land and made us understand why people thought of St. Kitts as a Caribbean paradise. 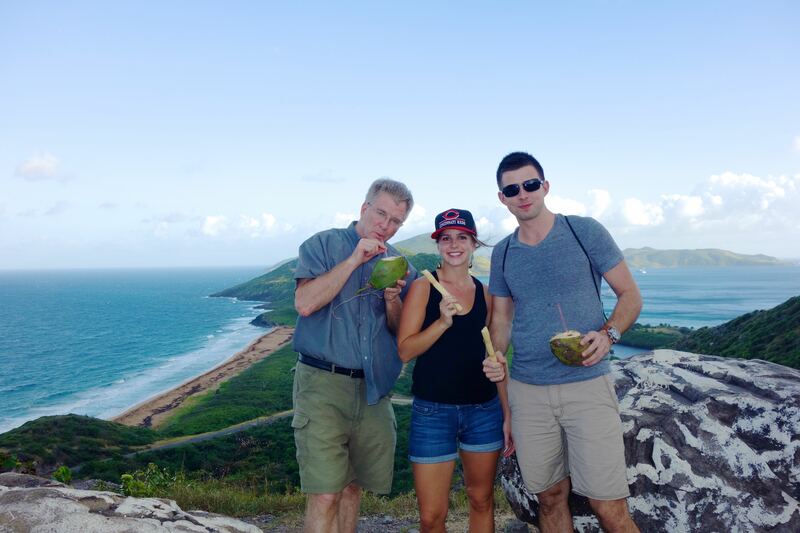 We savored refreshing baby coconut juice and fresh-cut sugar cane and gazed out in wonder to see where the Caribbean Sea and the Atlantic Ocean kissed the shores of the island. 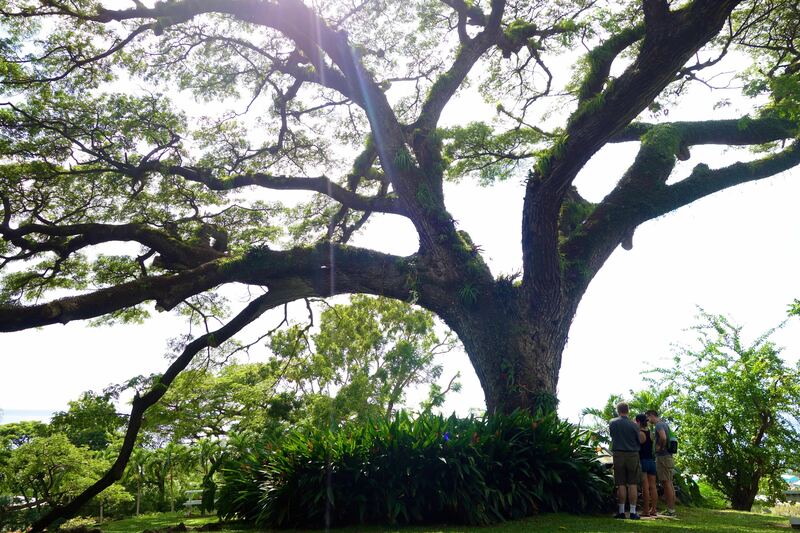 Rick, Andy, and Jackie take a moment to admire a lush and ancient tree on St. Kitts. 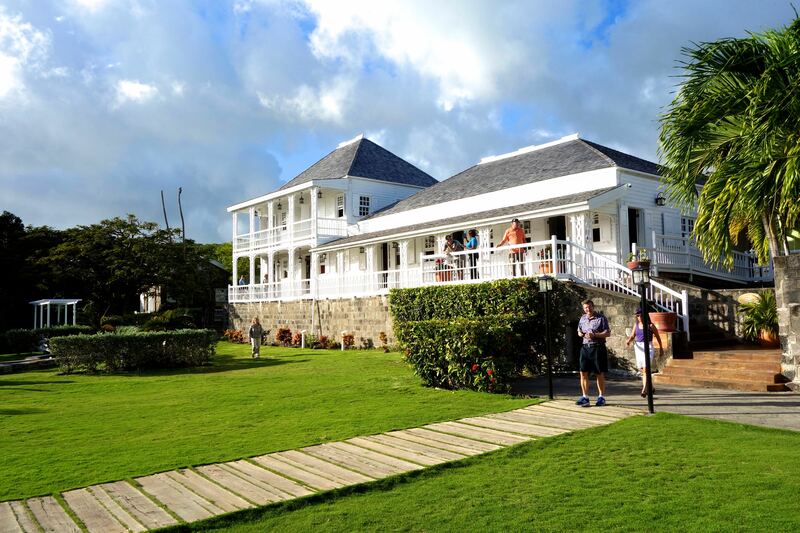 Tourists visit this former plantation home, admiring the decor and, hopefully, learning about its complicated past. 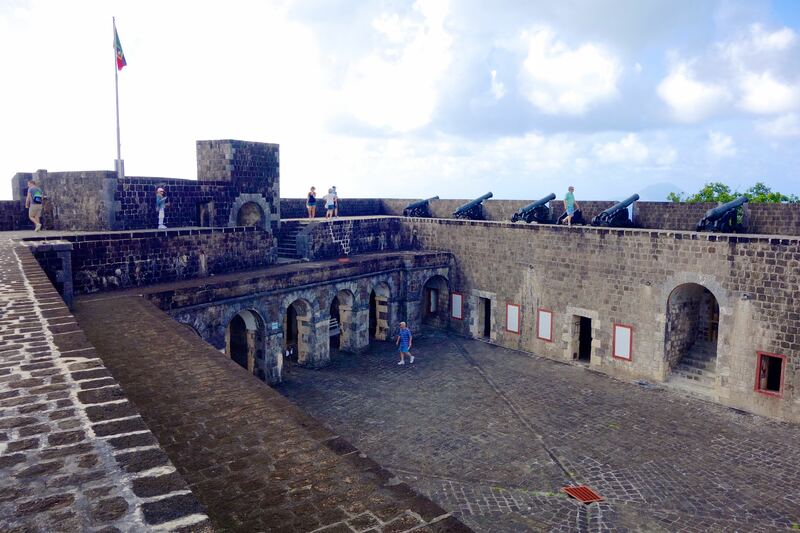 As a former colony of Spain, then of Britain, then both, then alternately of France and Britain, St. Kitts had plenty of lingering remnants of its conquerors and of those who were conquered–some in dilapidated condition, others well preserved as historic landmarks. We toured a former plantation, where despite the beautiful facade and pristine antique furniture displays, it was hard not to think of the slave labor that had long suffered to maintain and run this place. The advantages of building a fortress on the highest point of an island: easy to spot approaching enemies, perfect for admiring the stunning views around you. This virtually impenetrable fortress was built by the British, fought over by the French, and maintained with slave labor. A highpoint–literally and figuratively–was the Brimstone Hill Fortress. Aptly named, it perched on the highest hill, dominating the island with its massive stone structure. It was designed to be difficult to access with hairpin-turn roads that forced you to slow down and await an attack, impenetrable and virtually un-scalable stone walls, and cannons everywhere, pointing at any enemy ship who would dare to conquer this island. Nowadays, the only invaders on this island our tourists and cannons are now fodder for the visitors taking silly photos. The fortress merited awe with its spectacular views, its impressive design, and its imposing construction. And remembering that it was built by those who would lay claim to what was not theirs to begin with and who would enslave the native population to secure their interests demands thoughtful consideration. What a country will do to defend its procured land, if not the people who naturally inhabit it, is something, I think, we still grapple with today all around the world. 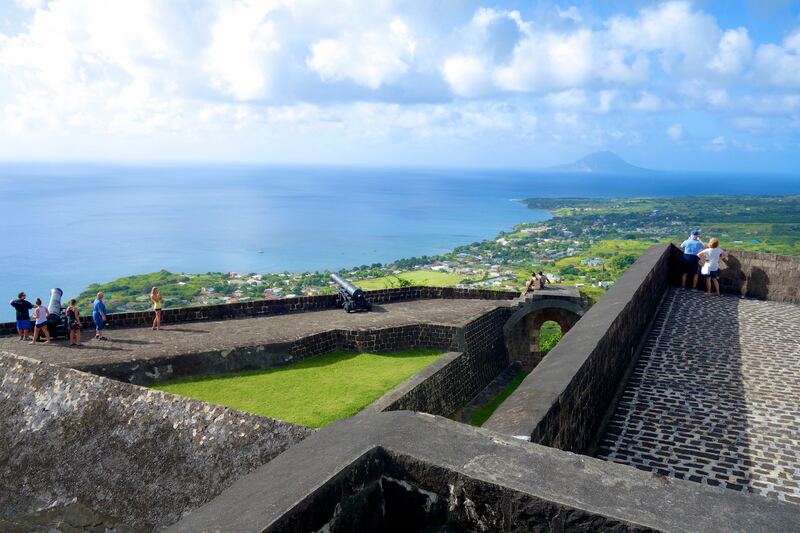 These landmark remnants are more than shadows of St. Kitts’ past, more than antique structures, and more than tourist sites. As with any country, this island nation’s history informs its present, and I wanted to understand that more. And understanding for us as visitors would come in the form of a raucous parade through the capital of the county. For more on this, stay tuned for the next post, Part II of this story on St. Kitts.